In a period of the season when every single point counts, the Titans let a big point slip between their fingers with an overtime loss to the West Nipissing Lynx. The Titans never trailed in the game leading 2-1 after the first and 4-3 following the middle period. But the last minute of the third, the Lynx pulled their goalie and combined with an error made in their zone the Lynx tied the game at 5 with 53 seconds left. And in overtime a breakaway goal proved to be the winner for the Lynx. In the race to the end of the season, the Titans are battling the Pirates for that important home ice advantage. Hopefully the lost point this evening doesn’t come back to haunt the Titans. With the single point the Titans claim 2nd place but the Pirates now hold two games in hand with one tomorrow evening in Sturgeon Falls against the Lynx. Joakim Braneby and Alex Provost-Ross each scored a pair while Axel Hallor had the other goal. Dayton Murray had 3 assists and Loic Odin had 2 of his own. Tim Cachard takes the loss. Shots were 52-42 Titans. 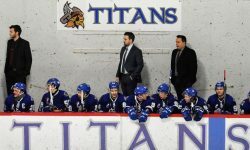 The Titans now have a week to prepare to meet the North division leading Bradford Rattlers at the Centre on February 8th.